There is a huge cross section of people throughout the world who want to learn how to wield a Japanese sword for personal enhancement, attaining rank or just to have fun. Some want to learn how to handle a sword without having to experience all the ceremony, rank and file while others desire to learn every formality. 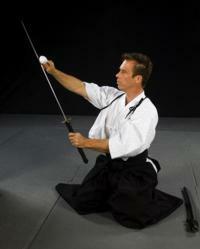 All have one thing in common and that is, the difficulty of finding a qualified sword instructor locally. The Martial University (TMU) changes all this. Through Samurai Sports on TMU, I can personally share with you my expertise. I can train you in the straightforward and practical manner I learned in Japan through the Japanese Department of Education. Samurai Sports offers a simple program that is easy to comprehend which will help you surpass your goals in your quest to learn the Japanese sword. You might be very serious about your sword practice, having studied for years and together we can take your practice to a whole new level, or you might be brand new to the sword. Maybe you have learned the many facets of kenjutsu, iaido, kendo and tameshigiri, and absorb the various sublets on your way to obtaining rank and certification but you still want more. At Samurai Sports I love to challenge my students to be the best! I incorporate sword techniques that have been used throughout the ages. I unravel for you the mysteries of the sword and its application and my students become proficient in the classical, traditional and combative aspects of the sword. Together we break down each and every technique, movement and transition with all the details and subtleties using the various methods of gripping, sheathing and drawing the sword. Together you gain an excellent understanding of sword katas and styles while learning how to cut correctly showing presence and strong demeanor. I have spent the last three decades dedicated to the martial arts and the “way of the sword” in the traditional manner it has been taught for centuries. 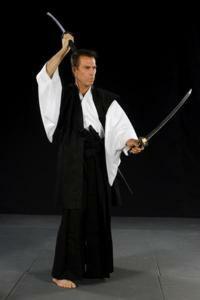 I am now using the latest in technology to share with you my knowledge and experience through The Martial University. Become my student, learn from me, watch the videos, read, study, practice, train and sweat again and again and beome the excellent swordman you have always wanted to be. Welcome to the University of Martial Arts where martial arts instructors and students come together to mutually benefit one another using the newest 21st century training tools. Through UMA, top notch instructors offer their students more opportunities to practice their art correctly through video training and where students benefit because they can practice “with their instructor” anytime day or night via online video! The University of Martial Arts also benefits potential students who can’t find an instructor in their community who teaches the art they wish to learn or whose lifestyle prevents them from studying during normal class hours.